I’m a huge fan of long climbs and have plumbed the Rocky Mountain Cycling Club’s database to see how all the climb’s in the state stack up. Most are memorable. The hard ones leave an indelible impression. Sometimes we remember the forest, sometimes the trees, sometimes the mountains, sometimes the monumental suffering. 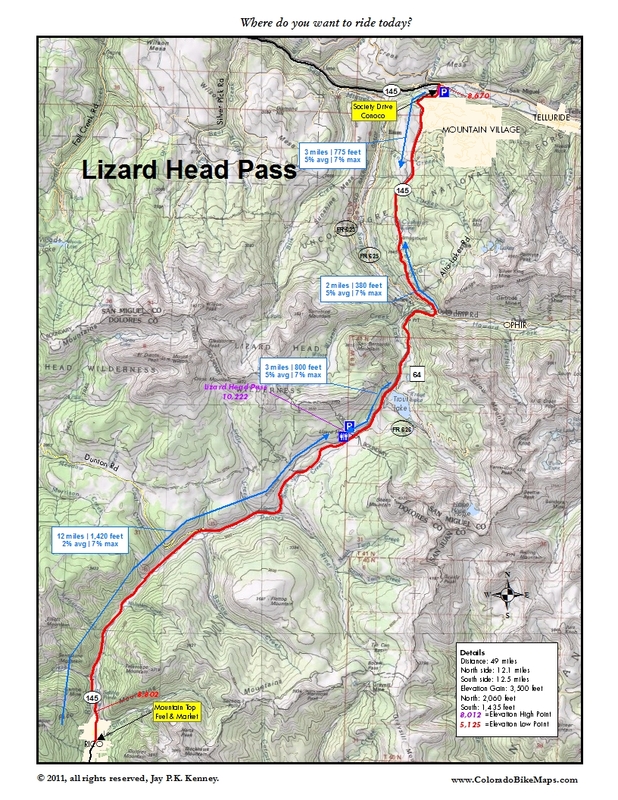 The database uses a complicated formula to assign a difficulty rating for each climb with Mt Evans the hardest (at 9.0) and Tennessee South the easiest (at .05). Somewhere in between falls Lizard Head Pass with ratings of 1.3 (north) and .9 (south). The pass connects Telluride to Rico and Dolores and is a good day’s ride as an out and back from Telluride to Rico. I used both sides as a training ride for the Mt Evans Hill Climb this summer, riding the top 3 miles on both sides several times in an effort (vain as it turned out) to get better acclimated at riding at altitude. At least I didn’t quit my day job. 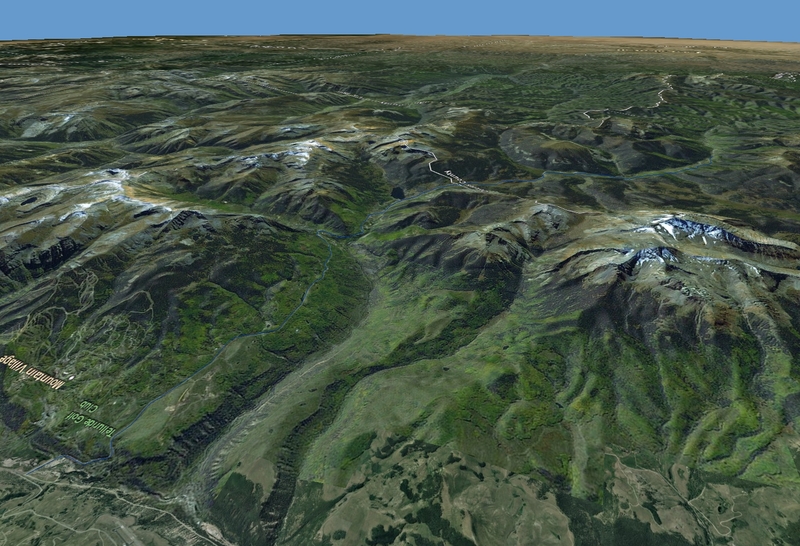 Here’s another view of the route against a topographic background. 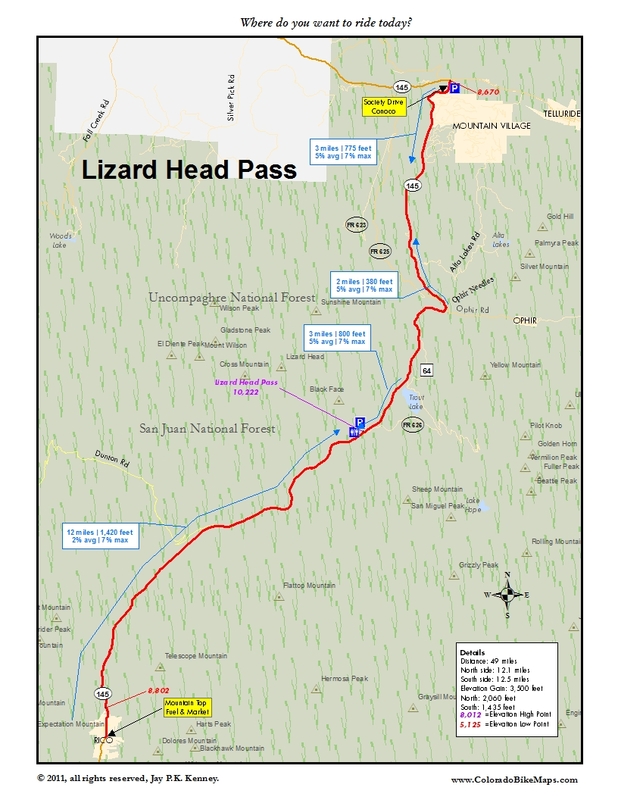 Lizard Head logistics are pretty straightforward: Start in Telluride, ride to the top of the pass or over to Rico. Return. 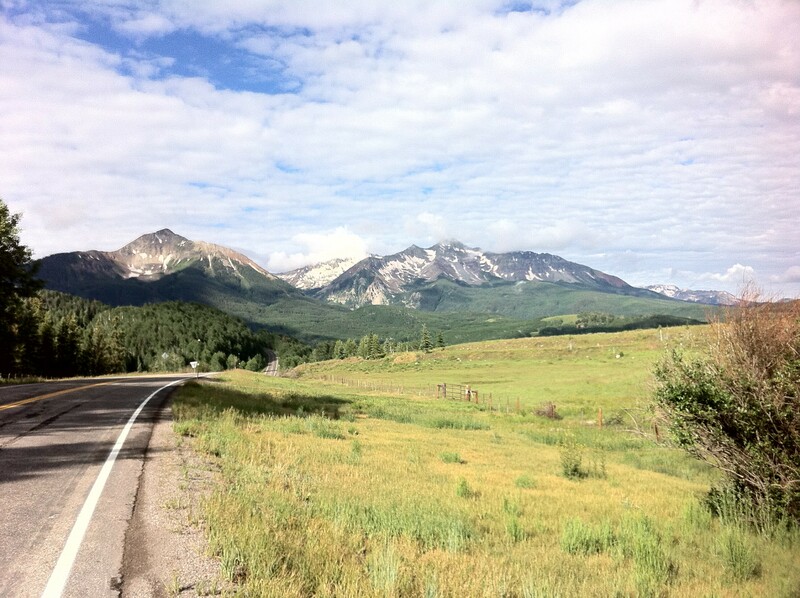 If you’re staying in Telluride, you’ll likely ride out from town on the bike trail. From Mountain Village, jump on your bike and go. For everyone else, park near Society Turn (there’s a small area looking out across the Valley Floor, recently the subject of a bruising legal battle between developers and preservationists), or at one of the ski area lots. The ride starts out with a bang and a fair amount of tourist and construction traffic, but gets better quickly once past Mountain Village. The road’s narrow and the traffic indifferent to your joy or suffering, so use caution in the first few miles. and the scenery is hard to beat, so stop whenever you start to feel the rapture coming on–it is probably just altitude sickness. The Telluride side is a mix of climbing and descending, with a fabulous, swoopy descent down into the Ophir Valley, home of the incomparable and eponymous Needles. There’s much to marvel and wonder at here, not the least of which is how the Galloping Goose got its name. The last three miles of the climb rival the first three in steepness and intensity. 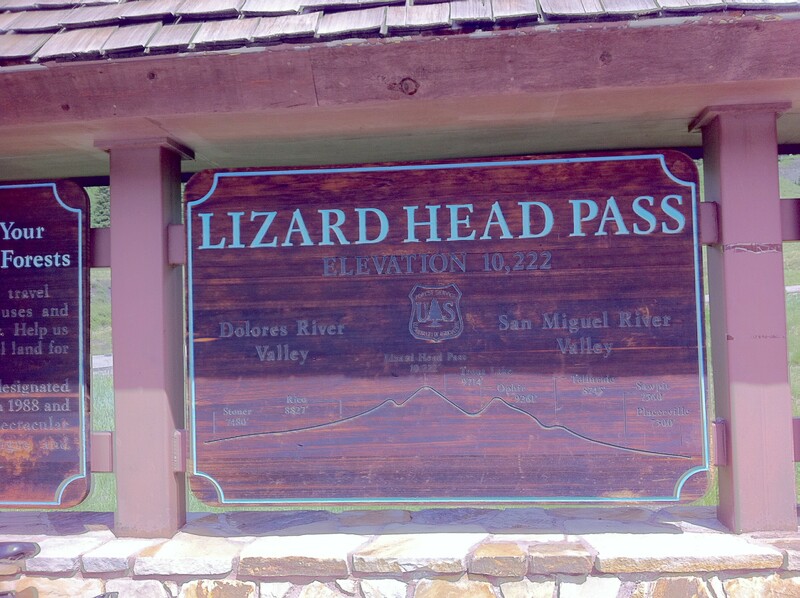 At the top of the pass, you’ll find the usual Forest Service paraphernalia, a useful parking area, and outhouses with a great view. You won’t be disappointed by the descent to or climb out of Rico if you go. It’s a long steady climb with half the traffic of the north side. 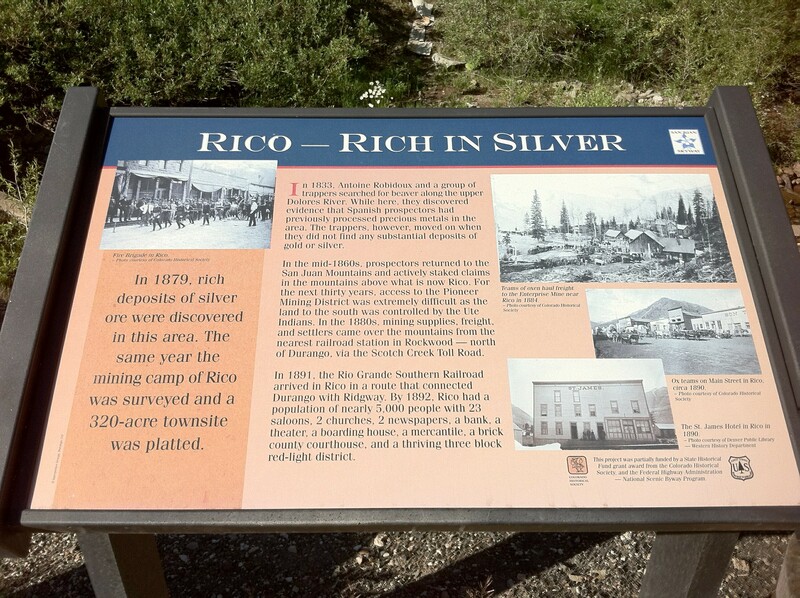 Rico, too, has a long and rich history and if you like small towns (it swells to the mid-hundreds in the summer) you’ll love Rico. There’s no fast food here, but if you’re looking for good food, check out the Argentine Grill at the Rico Hotel. 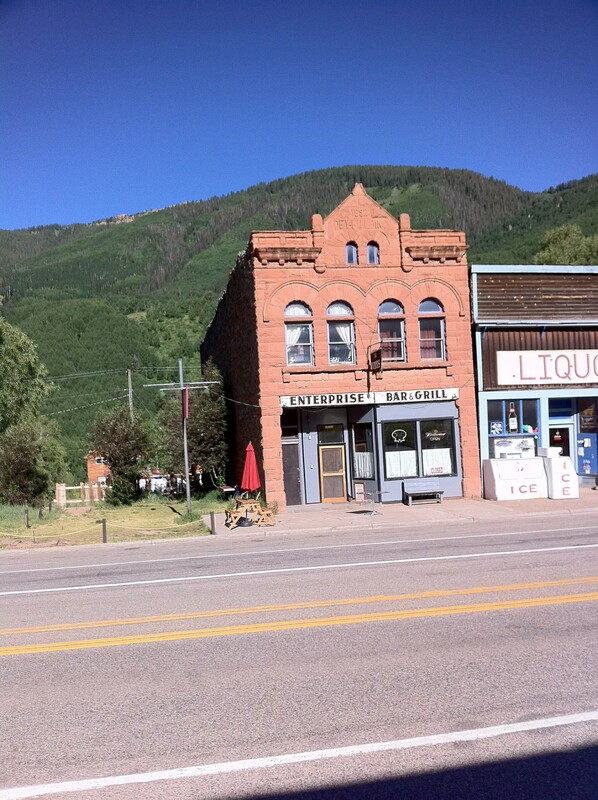 A small convenience store, Mountain Top Fuel & Market, will satisfy most of your other urges. 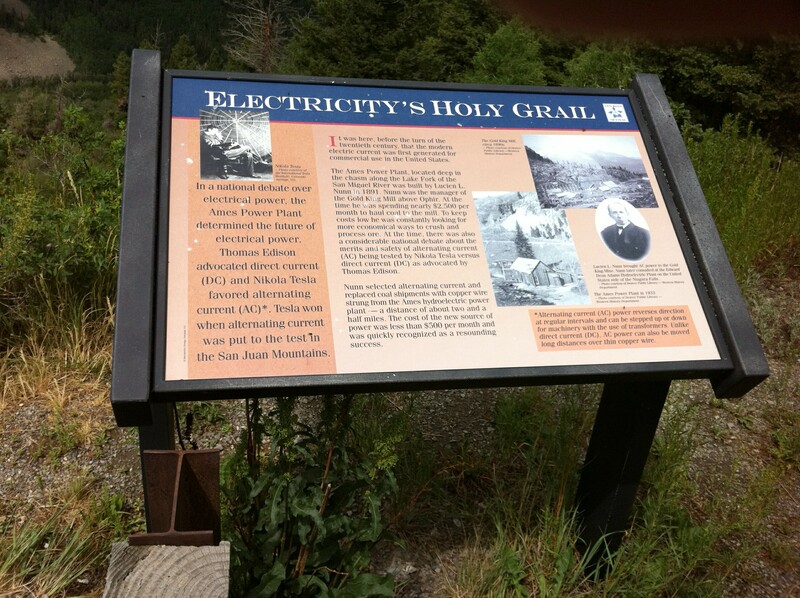 You don’t need much information to make your way back to Telluride. Just head back the way you came. 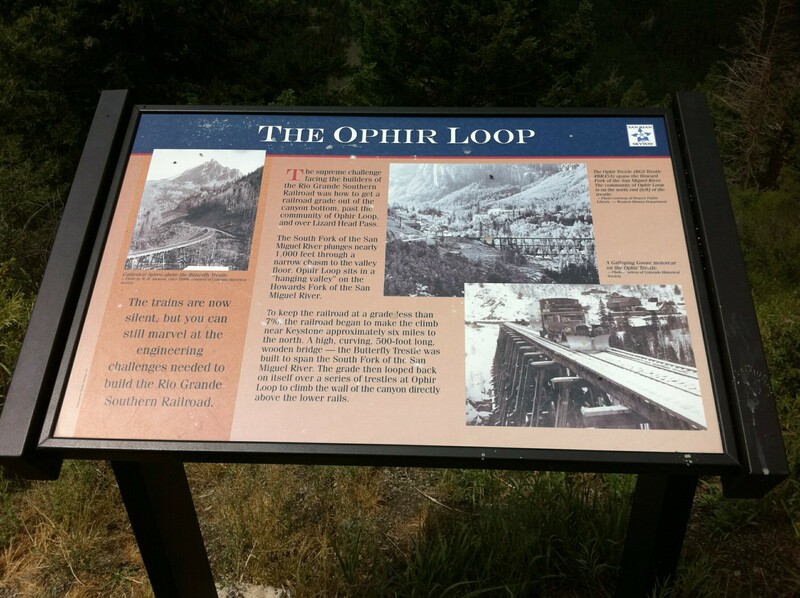 There’s a short steep climb out of the Ophir Valley that will get your legs warmed up again. And the final descent down into Telluride warrants caution: the road is steep, the traffic heavy, and the surface has been beaten up badly. Some of it is so terrible that CDOT has posted signs warning motorcyclists to slow way down. They paved the climb this weekend (Aug 19, 2012), it is beautiful road to match the scenery!